Lynton have an outstanding reputation for supplying medical-grade lasers to an extensive list of high profile clients, including the NHS. Lynton devices are considered by many doctors, dermatologists and aestheticians as the most effective, safe and reliable option when treating your removal needs. Another reason we use this supplier is because of the multiple awards they have won for the quality, safety and clinical results achieved with their equipment. They have won, for the second year in row, Aesthetic Awards; Equipment of the Year. We try to offer the best value for money and extend the offer to all our laser clients of 3-4-2 on all laser treatments. You simply pay upfront for two laser sessions and we’ll give you the third free of charge. This will ultimately reduce your session cost by 1/3 overall. We are thrilled to announce that we are now also offering laser removal treatment on semi-permanent eyebrow tattoos. Eyebrow tattoos and micoblading treatments have gained in popularity over the last few years. However, they can be restrictive, as fashions can change quickly, brow shape trends are constantly changing, and many people find themselves stuck with brows they really want to change. Also, sadly sometimes there is the need to remove less than satisfactory results. Using lasers for either tattoo removal or tattoo reduction (fading) has begun to be seen as the latest revolution in the expanding tattoo industry. Lasers have come a long way since their first uses with the potential to totally remove tattoos satisfactorily without leaving scarring or discernible changes to the skin. The uses of modern lasers with the correct procedures and aftercare mean that removal and reduction is safe. Lasering can also be used for fading older and dark tattoos for cover up work, therefore giving you the client more options for the new tattoo. Phoenix Tattoo & Removal use a Q-Switched ND:YAG laser supplied by Lynton Lasers. These are the most powerful and variable lasers which means that we can target the pigments to be removed with the correct wavelength of light at the correct depth using the correct power. This is a feature of our lasers which is not found in the vast majority of other studios who often use cheaper passive or IPL lasers. We offer our advice freely on the tattoo removal process and offer a free no obligation consultation with patch test. We have prepared far more information on the laser removal process than we are capable of explaining just on this one page. We highly recommend that anyone who is interested in under going laser treatment, reads it. We find that when customers understand how laser treatment works, what to expect and how to look after it then they get better results. Tattoo's stay under the skin as the ink particles are too large for the bodies immune system to remove. The laser passes a short pulse of light through the skin which breaks the ink into smaller particles. The body's immune system is then able to remove the ink particles naturally. This is a gradual process and multiple treatments will be needed. The treatment is uncomfortable. A popular description is it is like being pinged with an elastic band. The cost of each session depends on the size of the tattoo. Prices usually start from £40 for an area of 3cm by 3cm (smaller areas or small Indian ink tattoos may be less). Please feel free to pop in and see us, we will be able to give you a better idea once we have seen your tattoo. This is dependent on the actual tattoo and whether you wish to completely remove it or just dull it down to enable a successful cover-up. Tattoo's that are old and faded will be much easier and quicker to remove than a newer black or multi-coloured tattoo. Sessions are spaced at 4 week intervals. Unfortunately complete removal can never be guaranteed. Some colours are harder to remove than others and we will be able to discuss the expected outcome during our initial consultation with you. Treatment sessions can take from 5 to 40 minutes depending on the size of the tattoo. Are there any after-effects to the laser treatment? Redness and swelling may occur, a similar feeling to sunburn, however this will settle within a few days. Spot bleeding and therefore scabbing is normal. Some patients may blister, especially those with large areas of compacted dark ink (tribals etc). We will advise you at the consultation process of these. You will receive written aftercare instructions following your treatment. The treated area should not be exposed to strong sunlight or any tanning machines between sessions without the use of complete sunblock (SPF50). Generally speaking, the laser itself does not cause scarring and the active Q-Switched laser which we use is designed with this in mind. However it is imperative that the aftercare instructions are followed and these will be explained to you. The area must be allowed to heal naturally, do not rub or pick any scabbing or blistering as this could lead to scarring. Sometimes the original tattoo will have caused scar tissue which will become noticeable when the tattoo pigment is removed and we can advise you if we think this will be the case during your consultation. Is everyone suitable for laser treatment? No. There are some medical conditions which mean you may not be treated. A full medical question will be carried out before treatment commences. How many sessions to totally remove my tattoo? We use the attached document to give you an estimate based on the Kirby-Desal Scale. This is an industry standardised scale that combines a number of factors into giving you a guideline. 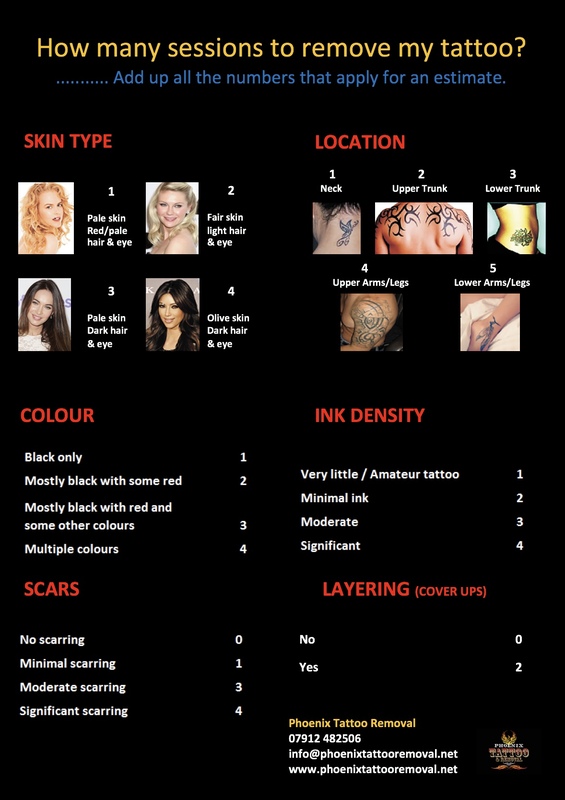 However this is only an estimate, what is not known is the type/quality of ink that has been used in your tattoo. The better quality ink, the harder to remove. We will be able to give you our assessment at your initial consultation. Laser Tattoo Removal Aftercare - this is given to you after your first laser treatment and is also available to download below. Please ensure that you follow our advice as it will aid the safe and effective results you desire. Lynton Lasers approved treatment clinic for laser tattoo removal treatments. Laser tattoo removal results at Phoenix Tattoo & Removal, 15 Hope Stret, Bellshill, North Lanarkshire, ML4 1QA. Telephone - 07912 482506.